Pandanus is a very distinct plant and adds architectural appeal as a specimen plant in the ground or a hardy accent in pots. 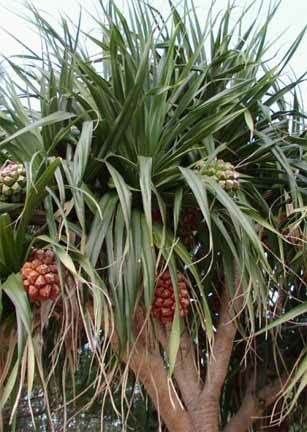 As the pandanus grows it produces air-roots that are sent down from the trunk to help stabilise the plant. It is perfect in pool side and coastal gardens. Parts of the fruit are edible. The ripe segments of the fruit and the seeds can be roasted and eaten. All parts of the plant can be used, from the nutritious fruits to the poles and branches in construction, to the leaves for weaving and garlands. Tolerates drought, coastal salt spray, full sun, wind exposure. Soil quality doesn't matter (sands, sandy loams, loams, sandy clay loams, clay loams, sandy clays, and clays). Usually found growing in beach sand, or on rocky exposed headlands. May be slow growing at first, so fertilisers and regular watering recommended to get started. Occurs naturally from Port Macquarie NSW to Torres Strait and beyond, but will grow in any frost free area. Normally at sea level but found growing at elevations of 600m or higher. The species is tolerant of moderately long droughts, e.g. 3�6 months or more. Older plants are tolerant of low� to medium� intensity fires.